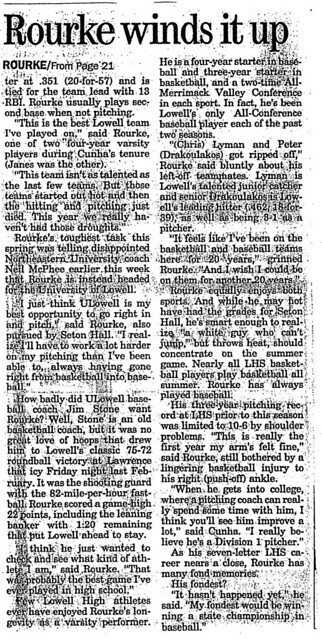 A truly gifted athlete, Kevin Rourke stood out on both the hardwood and the diamond as one of Lowell High School’s premier basketball and baseball player in recent history. As a member of the Raider Basketball team, Kevin was a 3-year starter and 2-time Merrimack Valley All-Conference and Lowell Sun All Star selection, regularly helping lead the Red and Gray into the Eastern Mass Division I Tournament. 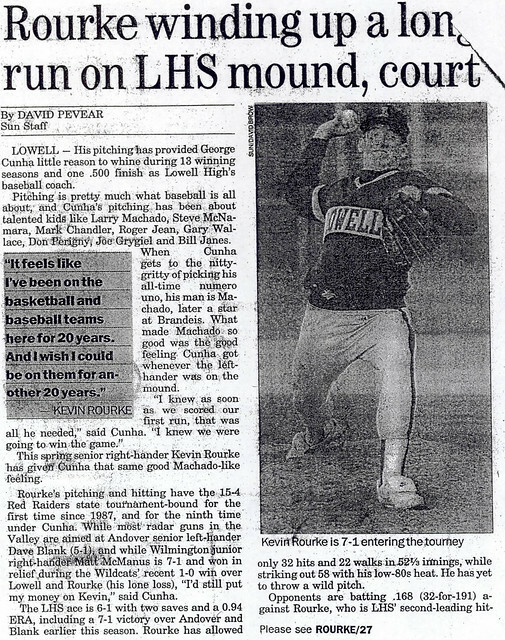 As a member of the Lowell High School Baseball team, Kevin established himself as one of the most outstanding pitchers in the school’s long and storied baseball history. Kevin was one of the few 4-year varsity performers in recent memory. During his first 3 seasons (1988–1990) Kevin battled periodic shoulder problems to compile a fine 1 0–6 overall record, including a perfect 3–0 during his freshman year. 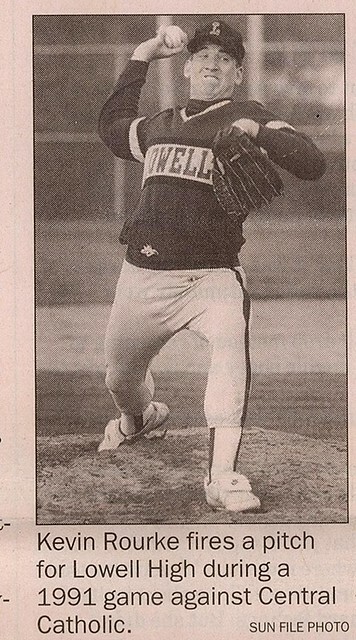 As a senior (1991) Kevin fashioned a superb season, finishing with a record of 8–1 with 65 strikeouts and an ERA of 1.27. An ever-improving hitter, Kevin recorded a batting average of 338 with 1 home run and 15 RBI. Kevin was an instrumental part of Lowell’s 1 7–5 season. Kevin was a Merrimack Valley All-Conference choice in both 1990 and 1991. He was selected as the MVC and Lowell Sun Player of the Year as a senior in 1991. 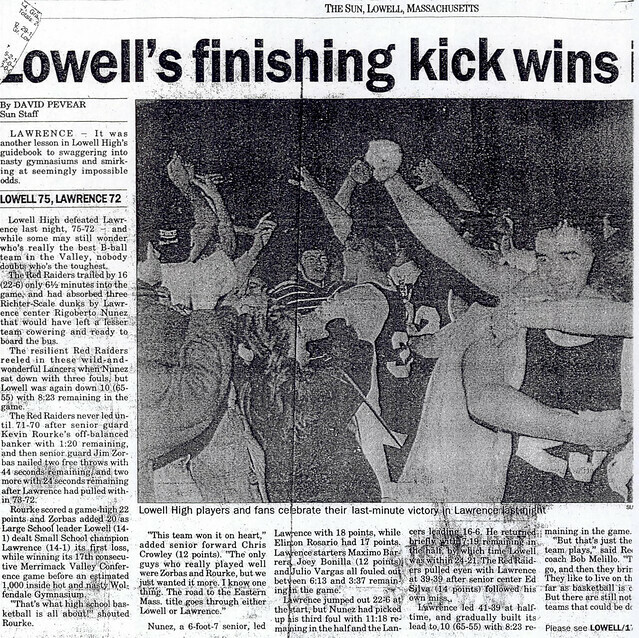 During Kevin’s career at Lowell High the Red and Gray compiled an overall team record of 49–32 with Kevin accounting for 18 of those victories–nearly 40%. 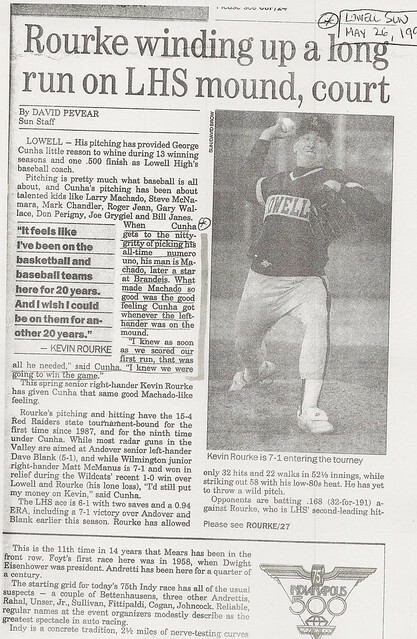 Kevin’s name appears regularly in the Lowell High Baseball Record Book, including: 2nd in career shutouts (5), 3rd in career wins (18), 3rd in wins in a season (8), and 9th in career strikeouts. (197). 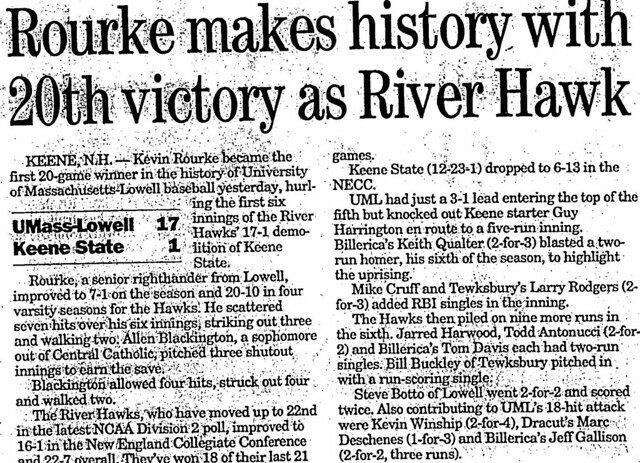 After graduation, Kevin attended University of Massachusetts at Lowell and embarked on a career for Coach Jim Stone’s nationally ranked River Hawks that ultimately ranked him as one of the greatest hurlers in the school’s history. A 4-year varsity performer, Kevin (UMass Lowell’s first career 20-game winner) ranks high in virtually every pitching category in the University’s Record Book. Among those are: 1st in career starts (40), 1st in starts in a season (14), 1st in innings pitched in a season (102.1), 1st in victories in a season (10), 2nd in career victories (23), and 3rd in career strikeouts (190). 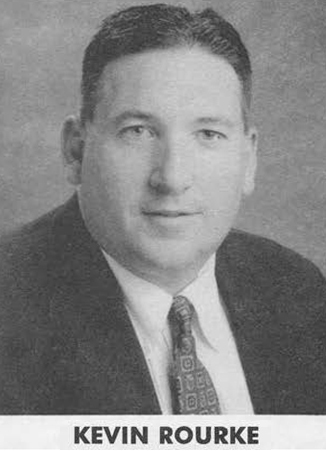 Kevin was named the New England Collegiate Conference Rookie of the Year in 1992 and was a NECC All-Conference selection in both 1994 and 1995. Additionally, in 1995 Kevin was chosen as UMass Lowell’s MVP and earned All-New England honors. 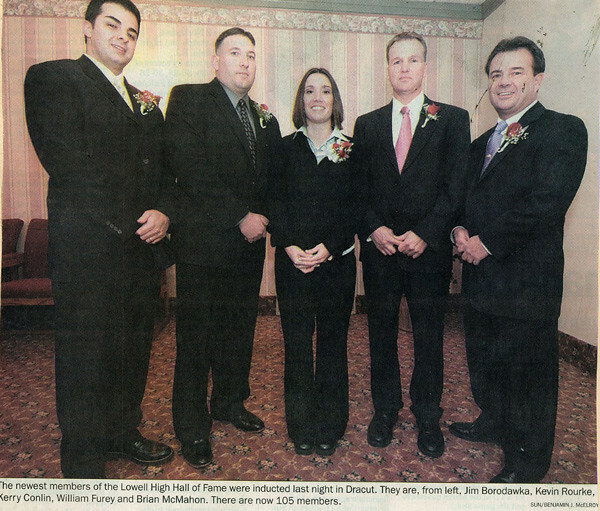 Kevin joins his sister-in-law Laurie Tucker Descheneaux (LHS ’91) in the Hall of Fame.